St. Louis Mayor Lyda Krewson says it wasn’t acceptable for police to chant “Whose streets? Our streets!” on Sunday after clearing out protesters and onlookers in the city’s downtown. Days of protests broke out after a judge’s acquittal Friday of Jason Stockley, a white former police officer, in the 2011 shooting death of 24-year-old black drug suspect Anthony Lamar Smith. Krewson also says it was “inflammatory” for interim police Chief Lawrence O’Toole to say that “police owned” Sunday night. The mayor says she’s planning to meet with protesters. Leaders of several faiths are calling for peace and justice amid the turmoil that followed the acquittal of a white former St. Louis police officer in the death of a black man. Several hundred people gathered Tuesday on a hot, unshaded public plaza for an interfaith service followed by a march to City Hall. The service followed four days of protests after a judge’s decision Friday to acquit Jason Stockley of first-degree murder in the 2011 shooting death of 24-year-old Anthony Lamar Smith. Speakers at the service included Roman Catholic Archbishop Robert Carlson, black church pastors, and Jewish and Muslim leaders. Protest leaders say no organized demonstrations are scheduled for Tuesday. Mayor Lyda Krewson says St. Louis has an opportunity to be a leader in addressing what she described as institutional racism in the aftermath of days of protests over the acquittal of a white ex-police officer who fatally shot a black man. In a statement Tuesday, Krewson said issues raised by demonstrators are valid and that she’s working to enact change. She said she’ll announce more details later. Protests began Friday after a judge acquitted white former St. Louis officer Jason Stockley, who fatally shot 24-year-old drug suspect Anthony Lamar Smith in 2011. The mayor and police chief have said protests have been largely nonviolent, although there’s been some vandalism and violence at night after organized protests are over. Krewson said she’s postponing town halls scheduled for this week. St. Louis Archbishop Robert Carlson is scheduled to lead an interfaith service calling for peace and solidarity amid unrest in St. Louis that followed the acquittal of a white former police officer accused in the killing of a black suspect. Carlson will be among several faith leaders speaking at the service scheduled for Tuesday afternoon at Kiener Plaza in downtown St. Louis. Monday was the fourth straight day of protests following a judge’s ruling of not guilty in the first-degree murder trial of Jason Stockley. More than 150 people have been arrested. So far, no organized protests are planned for Tuesday. A reward is being offered for information leading to the arrest of people accused of smashing windows during protests over the acquittal of a white former St. Louis police officer in the shooting death of a black suspect. The St. Louis Post-Dispatch reports that CrimeStoppers is offering a reward of up to $1,000. Tipsters with information about the windows that were broken Saturday night in the trendy Delmar Loop area of the suburb of University City can remain anonymous. The late-night property damage followed peaceful daytime protests, which began after a judge found Jason Stockley not guilty Friday of first-degree murder. Stockley had been charged in the 2011 death of 24-year-old Anthony Lamar Smith. A photo of one vandalism suspect has been released. Police say more will be released later. Questions are being raised about a tactic police used to control St. Louis crowds during rowdy protests over the acquittal of a white former police officer in the shooting death of a black suspect. At issue is a technique called kettling, which was used Sunday to corral people after windows were broken and trash cans overturned. The St. Louis Post-Dispatch reports that some of those caught in the box made by rows of officers said police overstepped their bounds. They say police used excessive force on non-protesters, including reporters and residents trying to get home. American Civil Liberties Union of Missouri attorney Tony Rothert says his office is “exploring whether litigation will be necessary.” Police say anyone who wants to make a complaint can contact the Internal Affairs Division. 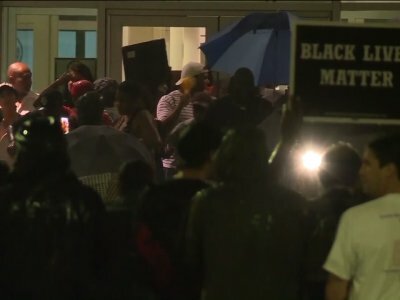 Protesters gathered outside the jail in downtown St. Louis to show solidarity with those who remain behind bars, but there was no repeat of the vandalism that occurred over the weekend. More demonstrations are expected Tuesday, four days after a judge found ex-officer Jason Stockley not guilty in the 2011 shooting death of 24-year-old Anthony Lamar Smith. Organizers did not give any details about Tuesday’s protests. Smith’s mother, Anne Smith, was among those outside the jail on Monday. St. Louis police say 123 people were arrested on Sunday, all but three of them for failure to disperse. More than 80 were arrested at one intersection, including a St. Louis Post-Dispatch reporter. Sean Porter, a demonstrator who was released from jail Monday evening, says they couldn’t leave the intersection because police had blocked them in.